Gaping holes in the roof of an affected store. MARUDI: Strong winds uprooted trees and ripped off the roofing of 12 units of longhouses, individual houses and stores at Long Banyok in Middle Baram on Tuesday, affecting 50 victims from the village. 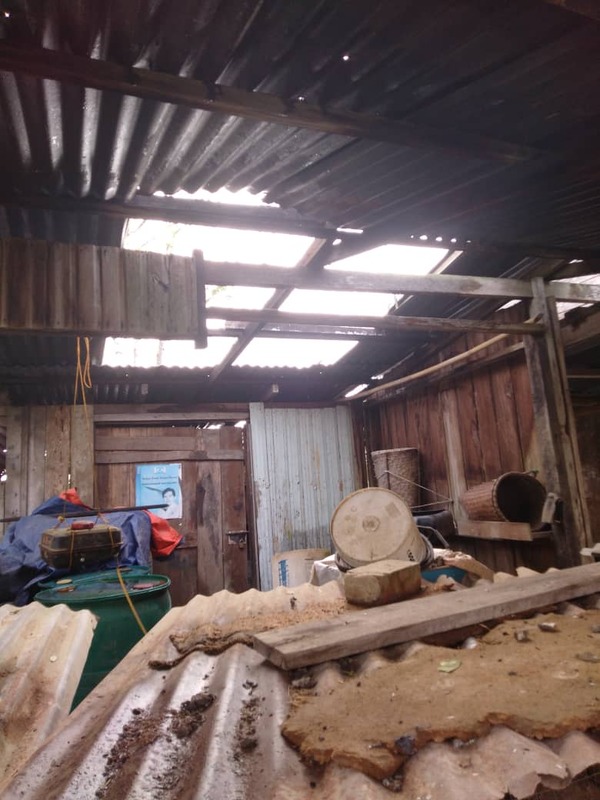 Village chief Matthew Balan said the scary incident occurred at about 4pm in the afternoon and ripped off zinc roofings from structures, landing them in the paddy fields behind the longhouse, about 50 to 100 metres away. The strong winds came from the direction of the river,” he told The Borneo Post. He has since lodged a police report at Marudi Police station today (Thursday) while the Welfare Department office has despatched officers to the scene to assess the damage and losses at the scene. According to a report, 11 doors of the longhouse, three stores and a rice barn was damaged in the incident. Telang Usan state assemblyman Dennis Ngau told the Borneo Post that he has been informed of the incident and requested the authorities to respond urgently to the request for building materials for repairs needed by the affected villages. He was unable to visit the victims as he is currently in the state capital attending the Budget 2018 session in the last DUN sitting for this year. After receiving the information, I immediately requested the Welfare Department in Miri and Telang Usan to immediately go the village to ascertain the type of assistance which the government could give, he said. Dennis said urgency in repairs is imperative to avoid damage to the victims property during this monsoon season.